For those following my Astorath conversion, well not really conversion... more like a Librarian model in a similar pose, I swapped out the head this past weekend and started painting him finally. 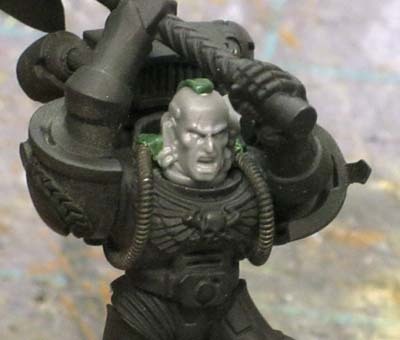 I swapped out the Blood Angel mask head with an unhelmeted one that gives a bit more of an aggressive look I think. The other head was good and worked with the force overall, but I think this one lends itself to the model and the pose more. It was a fairly easy change. It could have gone much worse, but it went smooth for the most part. I cut away where the power cables had been greenstuffed to the sides of his neck and popped the old head out of the neck socket. I glue everything with superglue and only use as much as I need to. That made the difference I think. Had I used plastic glue, I would not have been able to make the swap. Once I had the old head out, I greenstuffed a small psychic hood piece over the top of his head and then trimmed a little from the bottom at his neck. This allowed me to nest the new head down into the neck area and keep it from looking like it was sticking out too far. With the new head in place, I only had to resculpt the cable attachment points at his neck and I was all set. I've started painting him at this point. I enjoy painting blue on models. For me, it's a very forgiving color and easy to get a number and wide variety of shades with not too much work. I started with a black prime followed with GW Regal Blue for the base. Here I've got him washed with GW Asurmen Blue. That's why he looks wet. Once that dries, I'll go back with the Regal Blue to clean up some of the larger surface areas and then start adding highlights. I'll take a zenithal approach and work through GW Enchanted Blue up to another lighter color I have. It gets finished off with a light bluish-grey line highlight in the key areas for focus. I'm not sure if I mentioned it before or not, but the arms that were used to build this guy come from two places. The new Blood Angels and a regular bolter arm. 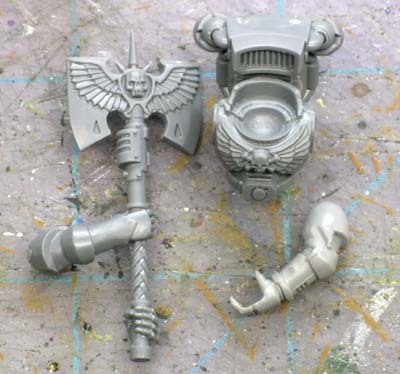 The regular bolter arm is cut off at the wrist since the weapon handle has both hands molded into it. It takes some positioning to get the arms just right along with a little greenstuff work at the shoulders to fill the small gaps. You need to make sure to do this part since the shoulderpads will not be covering it up like normal. The only other draw back or problem is that you have to sculpt his left forearm to match his right one since his right arm has a fancy kind of wrist guard in place you need to duplicate on his left to make the illusion complete. And last but not least, you need to cut the blade off the shaft of the weapon and then remount it once you get the handle positioned correctly. If you don't, he'll look like he's trying to smack his opponent with the side of the blade instead of the edge. This project has been sitting on my desk for a couple weeks now while we were trying to figure out if we were going to make him into a Librarian as well. I got the green light the other day and I've started work on him again. I managed to sculpt the ammo feeds that will connect his wrist mounted bolters to his backpack. There are a number of elements that work around his arms and I wanted to make sure I had these ironed out first. They were the biggest thing that worried me with this whole model. To make them, I had a piece of plasticard I used to work on. I laid out a piece of greenstuff and flattened it to the right shape (similar to the previous ammo feeds) in terms of width and such. I cut in some indentations along three sides. When it cured, I peeled it off the plasticard. Now all I need to to id cut in small indentations on the last side of the ammo feed and bend it to shape. I'll most likely have to pin it for extra stability, but the greenstuff allows me the flexibility to get from the bolter up to the backpack. Looks great, Ron. Forgot to comment on your last post about your comeback, but it's great to see FTW rise from the ashes. Keep up the great work. Baraccas: I'm painting the Astorath model today. Well, I'm at least working on his armour. It will take the longest of all the parts. Looks awesome. I really like the face that you choose. 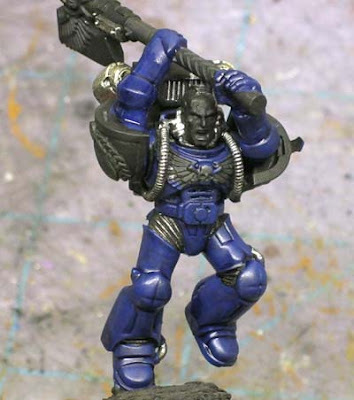 Did you use specific hands/arms for this conversion? LuckNo.5: Thanks, I think it fits his pose a little better in the end. The other head worked well, but this one feels right. 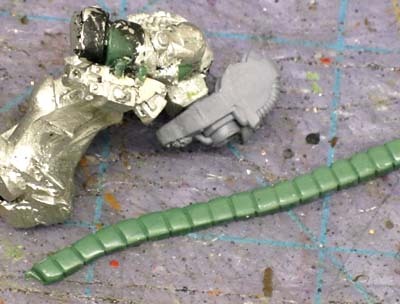 Skarvald: I added a section to the post covering the arms used. Sorry about that. The bits are easy to come by, but it takes some work to put it all together. Cool, I'm glad it helped. I was going to check your site and I typed fromthewarp in place of blackdotbarrel in the adress box and when I´ve seen this site is rolling again I almost fell down the chair!!! Nice to see FTW up one more time, and as always... very nice entry. Grajo: Thanks, I just finished the blue armour and I'm hoping to post the results tomorrow if time allows. You mentioned typing FTW instead of BDB... would you believe my computer here at home never recognized BDB as a site I visited frequently, but kept FTW at the top despite the drop in the number of times I visited it. Even my computer knew on some level I guess. Muskie: Sorry about that, I thought I had a headline that was clear enough. Glad to hear you're getting to do your conversion though.